Where Can I Change Euro Coins? You probably have loads of loose foreign currency and maybe even out of date coins lying around your house just cluttering drawers and change jars. So maybe you’re asking yourself where can I change euro coins and leftover currency? The bad news is that your bank is probably not going to assist you in changing your Euro coins back into Sterling. Unfortunately, they are not obligated to change your foreign currency back into Sterling. The good news is that Cash4Coins can help and we are ready to help you now. At Cash4Coins we provide a service to help you convert out of date and any foreign currency into cash that the banks will not exchange due to the high costs they incur in repatriating the money. Our team of experts are always on hand assist you with ideas for fundraising or any help you may need with exchanging your coins – even if you’re just looking to cash in your holiday money. 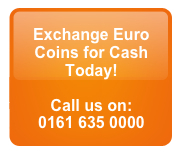 So if your wondering where can I change euro coins and foreign currency, we can help. Cash4Coins are the UK’s trusted brand where exchanging coins is concerned and it really is a very simple process. Once you have gathered all of your coins together, all you need do is send them to us, we will then count the currency and sort it to make sure you gain maximum value from it. We will then send you an offer, and once you accept you will receive prompt payment (usually in under 1 hour). In the unlikely event, you are not happy with the offer we make we will return the coins at no cost to yourself – that’s our 100% satisfaction guarantee. If you want to see just how good our service is then take a peek at our customer comments. And if you’re ready to send coins right away then please go to our page will full instruction at ‘How to send us coins‘. If you are one of the many people wondering where can I change euro coins and my leftover currency, contact us today to turn it into cash – we just love to help! Whether you are a charity or a member of the public looking to change back holiday money, our track record really does make us the number one choice when you’re wondering how can I change Euro coins. More and more charities are using our services because they want to find different ways to raise cash. With so many foreign coins sitting unused around the country, it makes sense for them to ask for foreign coin donations and for us to change the currency for them. Don’t delay – send your Euro coins to us today for a quick and fair valuation. Remember, you don’t even need to spend the time counting or sorting through your coins and we take all denominations. We can also exchange your Euro notes if you are lucky enough to have saved any of those from your last trip away.